Lobster Trap Gift Set gift basket! Perfect match for the gift of fresh lobster. 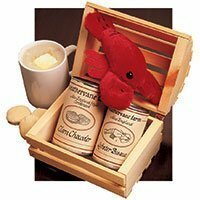 Lobster Trap Gift Set: creamy lobster bisque (10.5 oz.) and tasty clam chowder (15 oz.) packed in a wooden lobster trap gift box and topped with a red plush (guaranteed non-edible) lobster.